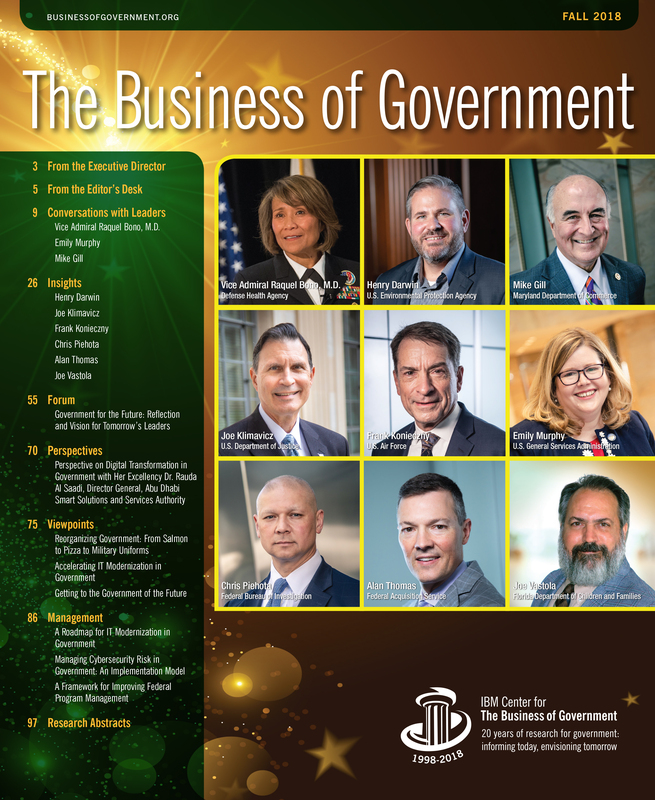 This edition of The Business of Government magazine marks the 20th anniversary of the IBM Center for The Business of Government. For the last two decades, the Center has led the charge of connecting research with practice and advancing public management scholarship, all while providing leaders with practical insights and actionable recommendations on how to enhance the way government does its business. Since its inception, the Center has always complemented its rigorous public management research by offering government executives a platform for telling their leadership stories on its weekly interview program, The Business of Government Hour and its video companion, The Business of Government Hour-TV. These conversations inform the Center’s research agenda as well as enable us to get that research to those on the frontline of public service. Leadership is at the core of the Center’s mission. Successful leadership is a measure of how we respond to volatility, uncertainty, complexity, and ambiguity—the unknown. By this definition, the Center continues to respond by making the unknown—knowable and the untried—mainstream in public management. Throughout the year, I have the pleasure of speaking with key government executives and public sector leaders about their agencies, accomplishments, and visions of government in the 21st century. The three government leaders profiled in this edition underscore the importance of public service and ethical leadership. These individuals are truly changing the way government does business on multiple levels. Vice Admiral Raquel Bono, M.D., Director, Defense Health Agency, leads an integral component of the Military Health System that serves as a strategic enabler, ensuring a “medically ready force and a ready medical force.” DHA focuses on improving readiness and healthcare, while working to lower costs. Vice Admiral Bono discusses DHA’s evolving mission, its work to create a more integrated healthcare system, and her efforts to improve the readiness and health of service members. Emily Murphy, Administrator, U.S. General Services Administration, spearheads the support of the missions of many federal agencies. These agencies need mission support services that are easy-to-use, reliable, and cost effective. Administrator Murphy outlines her strategic priorities, efforts to simplify how industry works with government, and ways it is promoting smarter management, buying, and the efficient use of technology across the federal government. Mike Gill, Secretary, Maryland Department of Commerce, fosters an economic development culture in a state that seeks to maximize its greatest assets and create quality jobs. The state of Maryland is doing just that through a series of initiatives that increase competitiveness, transform economic development programs, and meet business needs in the 21st century. Secretary Gill highlights the mission of the department he leads. He also explains how Maryland is attracting and retaining businesses and what it does to promote the state’s economic prosperity. I’ve interviewed a variety of government executives who manifest the leadership and commitment needed to meet their varied missions. In this edition, six government executives share their insights on the work they do and the efforts they lead. Their respective missions force them to look ahead, and although they come from diverse disciplines, they are all focusing on finding what works. Henry Darwin, Acting Deputy Administrator and Chief of Operations, U.S. Environmental Protection Agency, ensures that the agency is running as effectively and efficiently as possible. He is the key advisor to the EPA administrator on day-to-day operations and the leader of the agency’s transformation to an organization of continuous improvement. Joe Klimavicz, Deputy Assistant Attorney General and Chief Information Officer, U.S. Department of Justice, provides high-quality and secure information and technology services that enable the DOJ to meet its important missions. He has sought to transform the way the department does IT, finding ways to be innovative and cost effective. Frank Konieczny, Chief Technology Officer, U.S. Department of the Air Force, injects new technology innovation across the entire Air Force enterprise. He works to advance the technology landscape of the Air Force, focused on developing the technical target baseline and determining how these technologies can best be applied across the Air Force. Chris Piehota, Executive Assistant Director, Science and Technology Branch, FBI, enables and enhances operations and investigations for national security and criminal investigative programs. He leads an enterprise service provider of technological services and products across the bureau that enables agents to conduct investigations and operations most effectively. Alan Thomas, Commissioner, U.S. General Services Administration, Federal Acquisition Service, leads a premier provider of acquisition and technology transformation solutions and promotes smarter buying, the efficient use of technology, and reduced administrative costs across the government. His vision is to make FAS easy, efficient, and modern. Joe Vastola, Chief Information Officer, Florida Department of Children and Families, manages the entire IT services portfolio and infrastructure for one of the largest state agency in Florida. He puts IT to use protecting the most vulnerable citizens of Florida while also promoting strong and self-sufficient families, and helping advance personal and family recovery and resiliency. Beginning in the 1990s, the Internet ushered in a revolution in the way citizens and businesses share, access, and retain information over open networks. These digital steps forward have led to a significant change in how information technology impacts society, the economy, and government. It has led to a digital transformation in how nations govern. The Abu Dhabi Smart Solutions and Services Authority (ADSSSA) works across the Emirate’s government enterprise to develop smart systems in the delivery of government services. It does this by focusing on the combined experiences of all categories of customers to improve and assist the work of the government services sector. Her Excellency Dr. Rauda Al Saadi, Director General of the Abu Dhabi Smart Solutions and Services Authority, joined me on The Business of Government Hour to share her perspective on Abu Dhabi’s digital transformation strategy and how ADSSSA is changing the way citizens engage with their government. Leadership stories are at the core of every magazine. In this edition, I profile the work and efforts of ten government leaders encompassing a wide range of disciplines, a diverse set of experiences, and a vast span of geographies. From these conversations, I have gleaned five key insights that speak to the public service journey of these ten leaders and serendipitously illustrate the essential ingredients to the two-decade success of the IBM Center for The Business of Government. Articulate a vision. You have to have a plan and work to that plan. You’re not going to be effective if you don’t know where you’re going. Articulating a forward-looking vision that bridges the gap between policy and action will help ensure that the organization is doing what you want it to be doing. A clear strategy provides a destination of how you and your leadership team get to where you want to go, given constraints within your operating environment and the resources available. There’s this quote in Alice’s Adventures in Wonderland, “If you don’t know where you’re going, any path will take you there.” If you don’t keep focused, then you risk accomplishing little to nothing. Think strategically. Leaders must look beyond the tyranny of the present. In other words, you must define and then tell people what you want to get accomplished. A key to successfully accomplishing your goals and objectives is clearly communicating them to a variety of audiences. Don’t just live in the moment, but also anticipate and be mindful of the future. Forecast probable successes and avoid potential failures. Develop and engage your staff. Ensure that you have the talent to meet current and future challenges. Your staff has much to offer your organization via their ideas, including innovations, to improve the performance of the agency’s programs and activities. You will be able to learn much about your agency by going out and listening and engaging with people, especially those on the front lines. You have a vision, now you have to share it and get others on board, otherwise it will never be accomplished. This is done through inspiring and motivating the entire organization to stretch toward the realization of that vision. It is through getting your employees excited about the work they are doing that the vision can be achieved. Put those you serve first. Government leaders serve the public. Get out and talk with your customers. Ensure all customers have a voice and that every voice is heard.You will learn surprising things your employees and stakeholders may not tell you. Encourage your senior managers to do the same. Recent technologies allow new ways to constructively engage with your customers. Use them. Communicate, communicate, communicate! Typically, people think that good communicators talk more often, send more messages, and let people know more information. In other words, they believe that the solution to better communication is to do more telling. The most effective communicators are also very good at asking the right questions and listening. Ask pointed questions to ensure that others understand and then listen carefully—that will help you understand what’s going on in your organization.